CBAC Forecaster's Blog: What are facets? If you've been reading our avalanche advisories lately, you've probably noticed we've been talking a lot about facets. 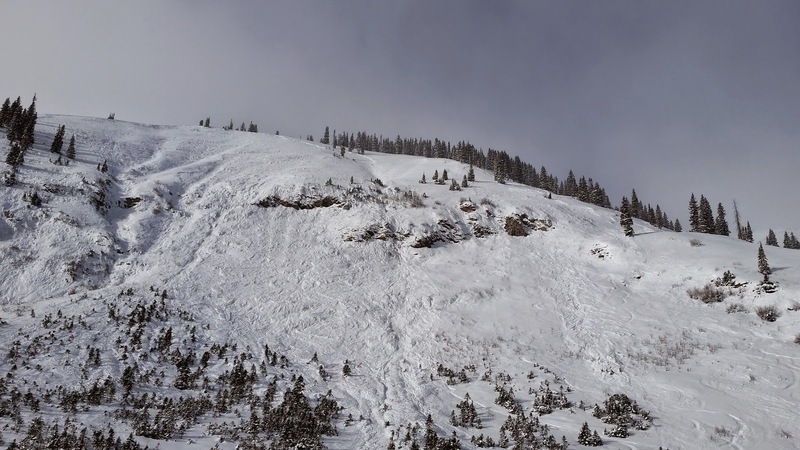 Last weekend, major winter storm slammed into our mountains, and we saw widespread avalanche activity, with facets being one of the major culprits. So what is the deal with this snow grain type, how does it form, and why is it so problematic? Facets are a sugary-like snow grain. They glisten in the sun, bounce in your glove, and commonly make a noticeably soft or hollow layer in the snowpack. If you look at them under a magnifying glass, they have many flat edges, hence the name facets. There are several different ways that can cause snow grains to facet, but they all share the same underlying physical process. Facetsform when water vapor moves quickly through the snowpack. Each particle gets handed off between grains, via sublimation and deposition, causing the grains to reconfigure into a more angular form. Strong temperature differences within the snowpack cause this water vapor relay. We can see facets form early season when the ground is quite warm, there is a shallow snowpack, and the air gets cold, especially at night. This drives the water vapor upward through the snowpack causing it to facet, or rot out. We also see a similar process occurring on top of the snowpack, called "near surface faceting." When we get warm days and cold, clear nights, the snow surface undergoes wild temperature swings, causing the same rapid water vapor movement. This process is expedited if the surface is composed of soft, low density snow, rather than stiff, hard, compacted snow. All of these ingredients have come together this winter. We have seen basal facets form during the early season when our snowpack was shallow. Then, on December 1st, we got about 4" of new, low density snow, which was followed by two weeks of warm days and cold, clear nights. That surface snow metamorphosed into fragile, sugary grains, and we didn't get strong winds that can sometimes destroy that layer as it is forming. On December 13th, that near surface facet layer was buried, and it is now under the weight of all the new snow that has fallen in the past 2 weeks. 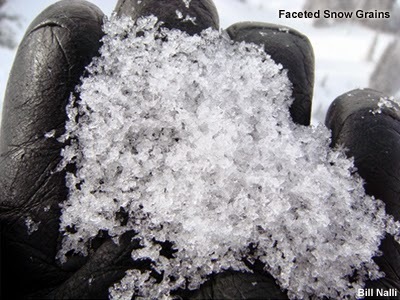 Facets form a type of layer in the snow coined as a "persistent weak layer." So once a layer of facets gets buried by a slab of new or windblown snow, it makes for a weakness in the snowpack on which avalanches can fail. Worst of all, the weakness is long-lasting, so we can see avalanches fail on facet layers weeks or months after they are buried. This means that we can see very large slabs of snow develop over the course of the winter before a facet layer might finally give out, causing a huge avalanche. Facets have a few other nasty tricks up their sleeves. If the layer is fairly continuous, it is so fragile that it can drive a failure very long distances across avalanche terrain. I've seen avalanches fail almost a mile wide on facet layers!! If you can get the layer to collapse on flat terrain, it can propagate up a slope and cause an avalanche to release above you. So not only do these layers plague us for long periods of time, but they also behave in an unusual manner. Keep this in mind in upcoming weeks and months, now that we have several facet layers buried in our snowpack. For more information or to get daily avalanche advisories, visit www.cbavalanchecenter.org.